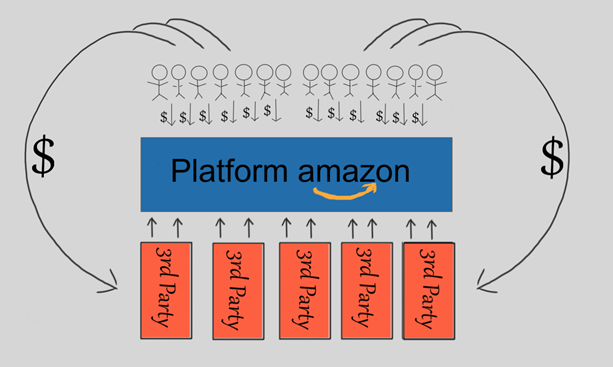 Amazon (AMZN) just released their shareholder letter. It's a must read even if your not a shareholder - always has some good insights, and what the landscape looks like. Bezos gives a nice portion of the letter on discussing their 3P (third-party) sales. Here's one quote that stood out to me. Inside, I know Bezos is loving that 3P is gaining larger share and momentum. A capital light model layered on top of a more capital intense business seems like a durable business to me. Getting paid to hold inventory is much better than having your own inventory sit in a warehouse to sell. Anyway, I figured I would highlight the letter is out for those who missed it. In addition, the discount I've been running for Wide-Moat Investing Platform will be removed a week from today. If you are interested in joining the team take advantage of the discount as its under $20 a month currently for annual subscriptions. There are no obligation with our 14 day free trial. Additional disclosure: The information contained on this article is not and should not be construed as investment advice, and does not purport to be and does not express any opinion as to the price at which the securities of any company may trade at any time. The information and opinions provided herein should not be taken as specific advice on the merits of any investment decision. Investors should make their own decisions regarding the prospects of any company discussed herein based on such investors’ own review of publicly available information and should not rely on the information contained herein. The information contained in this article has been prepared based on publicly available information and proprietary research. The author does not guarantee the accuracy or completeness of the information provided in this document. All statements and expressions herein are the sole opinion of the author and are subject to change without notice. Any projections, market outlooks or estimates herein are forward-looking statements and are based upon certain assumptions and should not be construed to be indicative of the actual events that will occur. Other events that were not taken into account may occur and may significantly affect the returns or performance of the securities discussed herein. Except where otherwise indicated, the information provided herein is based on matters as they exist as of the date of preparation and not as of any future date, and the author undertakes no obligation to correct, update or revise the information in this document or to otherwise provide any additional materials. The author, the author’s affiliates, and clients of the author’s affiliates may currently have long or short positions in the securities of certain of the companies mentioned herein, or may have such a position in the future (and therefore may profit from fluctuations in the trading price of the securities). To the extent such persons do have such positions, there is no guarantee that such persons will maintain such positions. Neither the author nor any of its affiliates accepts any liability whatsoever for any direct or consequential loss howsoever arising, directly or indirectly, from any use of the information contained herein. In addition, nothing presented herein shall constitute an offer to sell or the solicitation of any offer to buy any security.